NORWALK, CONNECTICUT – July 14, 2005 – Data released by Irving Levin Associates, Inc. confirms that venture funding to the pharmaceutical sector is in a downswing, and the type of acquisitions in demand is changing. During the first half of the year ended June 30, 2005, the pharmaceutical sector captured far less of the total venture capital committed to health care than during the first six months of last year. In the past six months, pharmaceutical companies have raised $823 million, or approximately 21% of all health care venture capital. During the same period last year, the pharmaceutical sector accounted for $1.4 billion, or approximately 39%, of all venture capital committed to health care. Deal volume in the pharmaceutical sector is relatively flat, with 43 venture financings announced during the first half of 2005 and 45 during the first half of 2004. Fewer large venture financings are being recorded in the pharmaceutical sector. This year, 15 pharmas have announced venture rounds of $25 million or more, totaling almost $580 million, but during the first half of 2004, 23 had announced venture rounds of $25 million or more, totaling more than $876 million. Merger and acquisition statistics for the first half of this year reveal dramatic changes in deal volume and in total dollars committed. The number of mergers and acquisitions in the pharmaceutical sector is down for the first half of 2005, with just 57 deals, compared to 84 in the first half of 2004. “Although the number and, average size, of mergers and acquisitions in the pharmaceutical sector decreased during the first half of this year, many recent deals are indicative of a trend towards the acquisition of compounds, rights, licenses and product lines, rather than deals for entire companies,” commented Stephen M. Monroe, Editor of The SeniorCare Investor. The demand for generic pharmaceuticals is also increasing, as name-brand drugs go off patent. Approximately $80 billion was committed to fund pharmaceutical M&A during the first half of last year; during the first six months of 2005, only about $23 billion has been committed. But if the single largest deal of each six-month period is excluded—namely the Sanofi-Aventis deal for $65.5 billion in 2004 and the Novartis/Struengmann deal for $8.4 billion in 2005—the totals are about the same, approximately $15 billion. Based on revealed prices, the pharmaceuticals sector represents 45% of all spending committed to health care mergers and acquisitions during the six months ended June 30, 2005. The three largest deals announced during the first half of 2005 comprise nearly 80% of all pharmaceutical M&A spending for the first half of 2005. Novartis acquired Hexel AG and 67.7% of Eon Labs for $8.4 billion; Sankyo acquired Daiichi Pharmaceutical for $7.8 billion; and Solvay Pharmaceuticals acquired Fournier Pharmaceuticals for $2.1 billion. in publications including, Healthcare Corporate Finance News, Health Care M&A Monthly and The SeniorCare Investor. 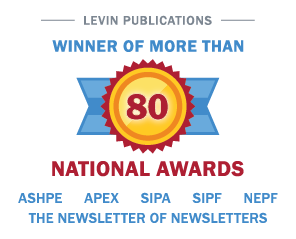 For more information on publications by Irving Levin Associates, Inc., please call 1-800-248-1668, or visit www.levinassociates.com.